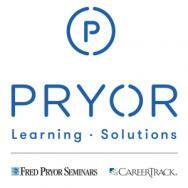 Pryor Learning Solutions, parent company of Fred Pryor Seminars and CareerTrack As a leader within the learning industry for more than 40 years, Pryor has helped more than 11 million people reach their career goals by offering comprehensive, affordable and convenient business, compliance and safety training. What began with Fred Pryor Seminars and continued with the acquisition of CareerTrack, has expanded to include competitive training for every industry and sector with a true blended learning approach that includes live and online learning options through Pryor Learning Solutions. • Intuitive and complimentary cloud-based learning environment requiring no specialized IT install, cost or downtime. • Access to more than 4,700 online courses, with new content added at no additional charge. • Free attendance at any of our more than 7,000 live seminars presented in more than 600 cities across the U.S. and Canada. • Robust training categories and meticulously curated content ranging from accounting, communication, compliance and workplace safety, to customer service, HR, IT, leadership, OSHA, project and time management and more. • Blended training offerings for any learning preference, such as in-person seminars and online quizzes, videos, webinars, and e-books. • Dedicated client support with weekly progress reports, customized curriculum mapping and marketing collateral for employee roll-out and the launch of special learning initiatives. • Continuing education credits for CEU, CPE, HRCI, PDC, PDU. • Accessible learning across a multitude of supported mobile devices.